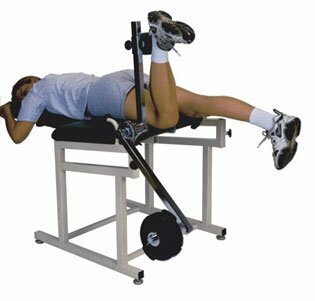 NK 331 Exercise Table for the knee w/one Torque arm is ideal for rehab clinics, physical therapy clinics, or even home use. Whether you are recovery from injury, surgery, or just getting into shape. The frame is constructed with heavy wall steel tubing, all joints are electric welded and finished in durable white or cream colored powder coat. Each polished chrome plated torque arm comes with a 5 year warranty, holds up to 75 pounds of Slotted Disc Weights (sold separately), includes vinyl covered padded roller shin pad, and is infinitely adjustable to ensure proper exercise patterns in the prescribed range of motion. Height-25" to 48" Length- 31" Width- 46.5"
If you have any questions about this product by NK Therapy Product, contact us by completing and submitting the form below. If you are looking for a specif part number, please include it with your message.